In April 2019, Ujeli Care Cente (UCC) made several enormous steps forward towards reaching the ultimate goal of providing sustainable, qualitative, free healthcare for the less fortunate children of Pokhara, Nepal. Since the finish of the summer project in August 2018, multiple developments took place over a short period of time. From April 11 until April 20, two members of UCC traveled to Nepal to evaluate the current status of the construction site of the Ujeli Hospital. Together, Nanou Winter and Alexander De Moor, both longtime members of UCC, finished a successful project. The purpose of this trip was to evaluate the last modifications in the construction and be present on the official opening ceremony of the hospital, which was scheduled on April 16, 2019. The official inauguration of the Ujeli Hospital was carried out by Sir Damu Adhikari, President of the Pokhara Chamber of Commerce and Industry, who is also a representative of the local Lions Club in Pokhara, Nepal. A traditional ceremony, in accordance with the Nepalese culture, was held with the attendance of the local press, envoys from several political organizations and representatives from the local community. In the last two years, the realization of the dental department has been made possible by the generous support of Medico Lions Clubs Belgium. Special thanks is expressed to the members of LC Antwerpen-Moerland, LC De Panne-Westkust, LC Tielt and to Mr. Luc Van Antwerpen for their contribution and for making this enormous endeavor a noteworthy success. The dental department was put into use on the opening day of the Hospital. The first patients were screened on oral and dental health. Together with DDS Deepak Ranjan, a local dentist specialized in Public Dentistry, Dr. Alexander De Moor performed dental screening in 28 children. Oral health instructions were given for all children, referral for urgent treatment was made if necessary, and a 3-monthly recall for follow-up was planned in July 2019 when the team of UCC is traveling to Pokhara for the summer project. All children were provided with a toothbrush and toothpaste. Furthermore, a new health topic on menstruation was added to the preventive program and was launched in a small female test group. Basic information on the female anatomy and the menstrual cycle was given. The purpose of this course was to implement the use of menstrual cups. The group consisted of 13 girls and women of the secondary school of Luang, a mountain region in the outer valley of Pokhara. This specific school has been followed by UCC for 8 years now and has maintained a close relationship with UCC. Every attendee received a menstrual cup, sponsored by UCC. Menstruation is a controversial topic of conversation in Nepal. With the introduction of the menstrual cup, UCC aims to improve health and feminine hygiene. UCC has been providing sexual health education for 3 consecutive years. From these experiences, the idea grew to continue working on improving self-care during menstruation in young women. Access to reliable, effective hygiene products is severely limited in Nepal. The common approach to deal with menstruation, consists of intercepting the monthly blood loss with a cotton cloth. According to ancient religious traditions, which are still regarded as an important aspect in the life of Nepali people, it is unsanitary to have a woman residing in the family house during this period of the month. As to which, many women have to sleep outside every month in human unworthy circumstances. It is the goal of UCC to make this controversy a negotiable topic in Nepal. A menstrual cup may be a vital attribution to the personal life of a girl. By increasing the knowledge of female anatomy and by offering women a means of emancipation; not only their personal health but presumably more aspects in the life of Nepali women will improve drastically. The lifetime of a single cup is well over 15 years. In this way, a cost-efficient product but also a sustainable solution is provided in regard to the climate change. In summary, the April project was a tremendous success. The progress made during these few days, marks an important milestone in the history of the existence of UCC. With the dental department operational, screening of oral health in the children of the schools followed by UCC, can be expanded by the possibility to refer patients to the Ujeli Hospital for extended preventive instructions and/or necessary treatments. It has been a remarkable observation over the last few years that these children would benefit greatly from basic dental treatment which from now on can be provided by UCC in the Ujeli Hospital. A collection of photos taken during the project in April 2019 were attached to this report. In the name of Ms. Nanou Winter and the UCC 2019 Team. UCC had another tremendously successful year. After finishing the project in the schools of Pokhara and coming back from Nepal in August 2017, a new team of volunteers has been brought together once more. For the 6th time now, 9 new volunteers were recruited from a group of over 80 candidates, to join a team of 6 other volunteers with experience from previous years. The enormous amount of people interested in the UCC project is a reflection of the huge progress of the last years. In September 2017, this group of 15 people started preparing for another Ujeli volunteer trip in the summer of 2018. On a monthly basis, events were organized, lectures were given, and sponsors were contacted. By July 2018, prior to departure to Nepal, a sum of over 30.000 euro was collected. Aside from this, another 10.000 euro was made available for the construction and organization of our future Ujeli Children’s Hospital. Finally on site in Nepal, the team of volunteers represented the Ujeli Care Centre Project with enormous enthusiasm and motivation. Striving for a better health care for the poor children of Pokhara, Nepal. Together with the Koirala family, whose devotion to the project is unseen and only tipped by their hospitality, the team has realized yet another year of progress towards our goal, by providing much needed health education and prevention programs for the children of Pokhara. During the period of July-August 2018, the same 9 schools and 1 orphanage have been visited to provide the essential care that these children still miss and need so hardly. Extensive recapitulation of previously acquired health topics about general hygiene and infectious disease prevention have been carried out. All children have been provided with toothbrush and toothpaste. During these health camps, medical examinations were performed to assess the general health and specific health needs of the students. If necessary, appropriate treatment or referral to a hospital was made. At the end of the summer project, around 1000 children were helped. We noticed that many of these students, who got education and yearly medical check-up’s by UCC over the last 6 years, have made a lot of progress in their health and health behaviour. Special attention was given to dental hygiene over the last 3-4 years, with the pending realization of a dental clinic in the nearby future. According to these serial dental investigations, incidence of caries and bad oral hygiene are dropping significantly due to our interventions. However, the need for treatment of heavily damaged teeth by caries remains high. These children would benefit greatly from basic dental treatment which could be provided by Ujeli Care Centre in the future. Keeping this in mind, we are aiming to open the dental department by May 2019, as first department of our future Ujeli Children’s Hospital. A collection of photos taken during the project in the summer of 2018 were attached to this report. Op vrijdag 6 juli 2018 gaan we in Koksijde back to the ‘60s! 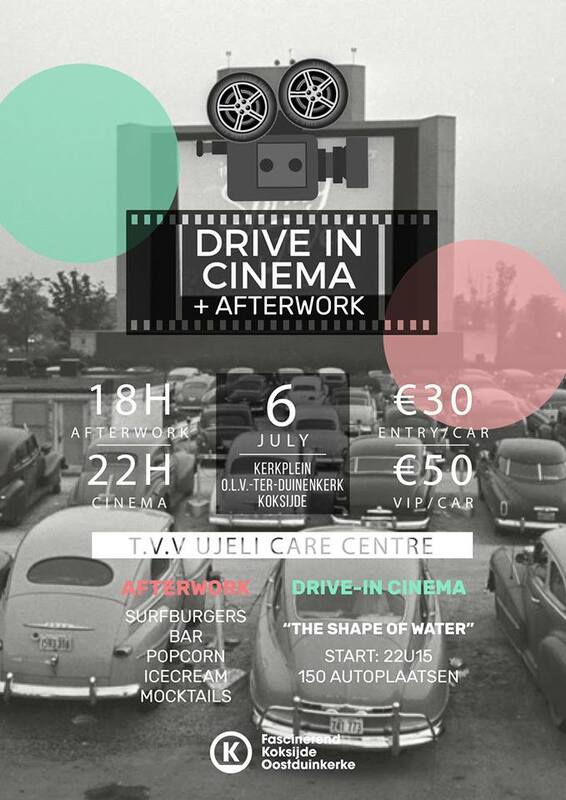 Picture this: een old school drive-in cinema met voorafgaand een zonovergoten afterwork.  Rond 18 uur gaat de afterwork van start en kunt u uw auto reeds klaarzetten voor de film op de parking van het Kerkplein. Op de afterwork wordt u voorzien van chille vibes, u gebracht door DJ Jeudy & Fish met bijhorende live sax door Ujeli member Simon! Denk verder nog aan heerlijke burgers by Surfburgers, ijs of popcorn in allerlei smaken, een mocktail & gin bar,… Kortom, een zalig moment om samen met je collega’s of vrienden uit te blussen van de werkweek.  Rond 22 uur wordt iedereen naar zijn/ haar auto verzocht, om in de wagen te genieten van de intrigerende en gerenommeerde film ‘The shape of water’. Het geluid zal via radiofrequentie rechtstreeks in de wagen worden afgespeeld.  De opbrengst van dit event gaat integraal naar VZW Ujeli Care Centre, een organisatie die gratis gezondheidszorg biedt aan meer dan 1000 Nepalese kinderen.  De eerste 50 inschrijvingen krijgen een gratis cinematicket, u warm aangeboden door Cinema Koksijde! Het is alweer bijna Kerstmis. Iedereen kent de zoektocht naar het ultieme en vaak last minute kerstcadeau wel... Dit jaar geen inspiratie of gewoon eens geen behoefte om op het allerlaatste de drukke winkelstraten at te kuieren ? Bij Ujeli Care Centre delen wij jouw mening en hebben wij de oplossing voor je! Wij bieden, een met zorg samengesteld, thee-setje aan. Alles wat je nodig hebt om je te weren tegen de koude winter-avonden mooi ingepakt! Het perfecte geschenk of uiterst geschikt om jezelf eens te trakteren. 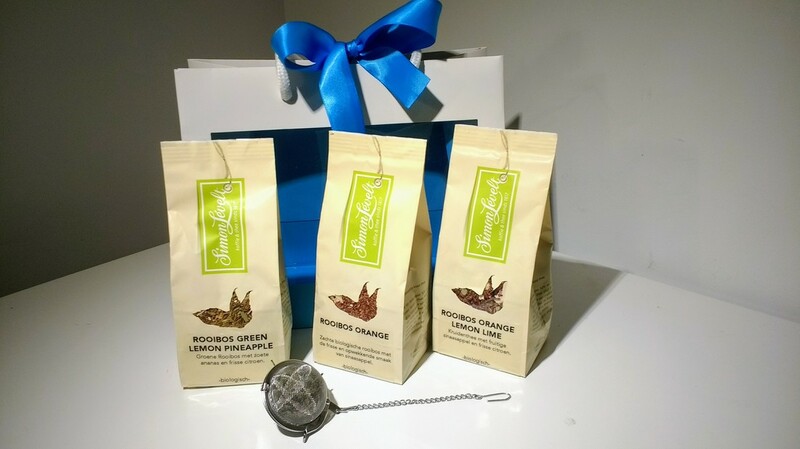 - Een pakje fruitige Rooibos Orange Lemon Lime. - Een zakje lekkere kaneelamandelen. - Een pakje verrukkelijke boterwafels. 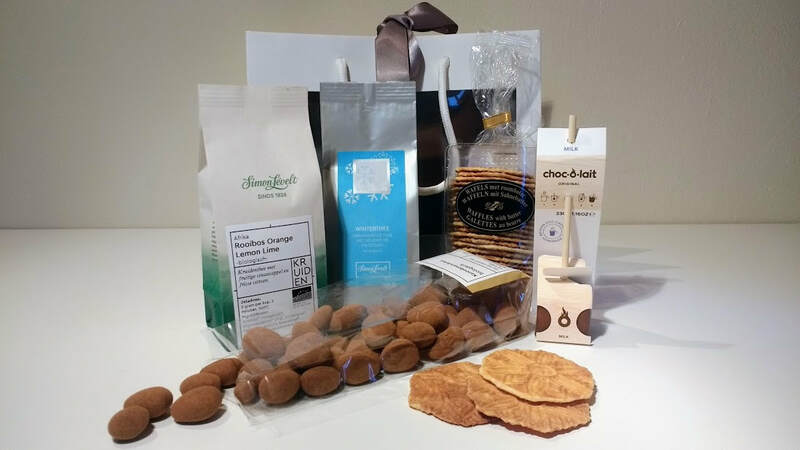 - ​choc-o-lait, een handgemaakt blokje Belgische chocolade op een houten stokje om heerlijke chocolademelk te maken. De winst gaat integraal naar VZW Ujeli Care Centre en wordt gebruikt om gezondheidszorg te voorzien aan kinderen in nood. PS: Bekijk het bestelformulier om te zien hoe jij een 헰헮헱헲헮혂헯헼헻 혁.현.혃. ퟮퟱ헲혂헿헼 kunt winnen! Ons vrijwilligersproject Ujeli Care Centre 2017 is afgelopen. Na anderhalve week zijn we weer geacclimatiseerd aan het leven hier in België: geen geclaxonneer van voorbijrijdende auto’s, ananassen en mango’s die verre van even zoet en sappig zijn en bovenal een fantastische gezondheidszorg. Als u één van onze vrijwilligers al bent tegengekomen na zijn thuiskomst, dan krijgt u als antwoord op de vraag: “En, hoe was het nu eigenlijk in Nepal?” vaak als eerste: “Het was zeer plezant!” of “Vree goed!” Dat is omdat onze ervaring in Nepal, niet altijd even makkelijk onder woorden valt te brengen. Over onze belevenissen en activiteiten daarentegen kunnen we blijven vertellen. Dat willen we ook doen omdat u als ouder, sponsor of sympathisant ons project het afgelopen jaar heeft gesteund en omdat zonder uw steun Ujeli Care Centre 2017 überhaupt niet mogelijk zou zijn geweest. Het officiële startschot voor Ujeli Care Centre 2017 werd gegeven op Parshyang 5 te Pokhara op 200km van de hoofdstad Kathmandu. Stuk voor stuk werden we hartelijk welkom geheten door Dinesh Koirala en zijn familie. Een eerste kennismaking en een feestelijke dal bhat later, kruipen we allemaal onder de dons. De volgende twee dagen bereiden we onze eerste Health Camp voor. We kuisen ons Centre op (onze eigen consultatieruimte waar kansarme kinderen uit de buurt naartoe komen voor dringende medische hulp, die wij gratis verlenen), bekijken welke medicatie we moeten bestellen, vullen de medicatieboxen aan en we maken tandenborstel-tandpasta-setjes voor de schooltjes. Na enkele dagen voorbereidingswerk splitsen we op in 3 groepjes van 4. Elk groepje gaat naar één schooltje en doorloopt daar het volledige programma: een wandeling maken in het dorp en de inwoners op de hoogte brengen van onze aanwezigheid en activiteiten, het Education Program en ten slotte de Health Camp zelf. Het Education Program bestaat uit het aanleren van correcte hand- en tandhygiëne en uit een aantal lessen EHBO. Hierin worden onderwerpen zoals flauwvallen, neusbloeding, snij- en brandwonden, verstikken en diarree onderwezen. We proberen dit op een leuke manier aan te brengen, aan de hand van een toneeltje overwinnen we de taalbarrière en houden we de lessen plezant voor de kinderen. Sinds dit jaar hebben we een les rond nutritie en voeding aan dit pakket toegevoegd. We trachten hierbij het belang van gevarieerde voeding en voldoende water drinken toe te lichten. Dit is relevant omdat het dieet van kinderen op het platteland vaak bestaat uit rijst, met hier en daar wat maïs en/of linzen en aangevuld met, als ze geluk hebben, één keer in de week kip. In samenwerking met SSIBENI hebben we dit jaar ook geïnvesteerd in ons programma rond seksuele opvoeding. Aan de hand van een kaartspel proberen we de Nepalese taboes rond contraceptiva, mannelijke en vrouwelijke puberteit te doorbreken. In dit kaartspel krijgen de leerlingen allemaal een aantal kaarten in hun handen. De kaarten zijn geïllustreerd en bevatten 3 onderwerpen per thema, dat overigens een eigen kleur heeft. Door kaarten door te schuiven is het de bedoeling dat de leerlingen een triplet verzamelen, kaarten met dezelfde kleur van hetzelfde thema. We bespreken dit thema dan in groep en beantwoorden hun vragen. Het gegiechel en soms wat onwennig geschuifel op hun stoelen bereikt een hoogtepunt wanneer onze vrijwilligers het gebruik van een condoom uitleggen en demonstreren. Ten slotte kregen alle kinderen een medical check-up. Nadat hun gegevens zijn opgeschreven op hun medical form worden gewicht, lengte en temperatuur opgemeten en komen ze bij onze vrijwilliger-dokters. We luisteren naar hun klacht, inspecteren de tanden, onderzoeken het neus-keel-oor gebied en het abdomen, ausculteren de longen en inspecteren de huid op wondinfecties en scabiës. Wij hebben altijd onze medicatie mee op de Health Camps en schrijven deze de kinderen gratis voor. Na 3 dagen komen al onze vrijwilligers weer samen in Pokhara bij de Koirala’s. Enthousiast wisselen we onze verhalen uit en komen we weer even op adem: we gaan momo’s eten, de Nepalese dumpling die je zowel gestoomd als gefrituurd kan eten, en genieten van het uitzicht aan Lakeside, het toeristische gedeelte van Pokhara. De volgende dag begint onze voorbereiding voor de volgende camp: de medicatieboxen worden gecontroleerd en aangevuld, er worden tandenborstel-tandpasta-setjes bijgemaakt en we houden de Ujeli Health Centre te Pokhara open. Aan dit tempo hebben we 9 scholen bezocht en zo’n 1050 kinderen bereikt. Zoals u misschien weet is Ujeli Care Centre niet het enige vrijwilligersproject in Nepal. Dit jaar werkten we voor het eerst samen met Maggie Doyne’s Blink Now Foundation. De Blink Now Foundation is erop gericht gratis onderwijs te voorzien aan kansarme kinderen in Surkhet, ongeveer 500km ten westen van Pokhara. Zij is tevens een thuis voor 50 kinderen die door Maggie geadopteerd zijn en financiert dit alles met behulp van donaties en campagnes. Verder tracht zij ook in te spelen op de problemen van de community door de bouw van een Health Clinic en een Women’s Center. Ujeli Care Centre werd uitgenodigd om een Health Camp te geven in de Kopila Valley School, de school die door de Foundation is opgericht en door haar gesteund wordt. 400 kinderen kregen door onze vrijwilligers een medische checkup. Hun gastvrijheid en dankbaarheid was ongeëvenaard. Het was een waar genoegen om samen te werken met de Blink Now Foundation. Hopelijk geeft dit jullie een goed beeld van de activiteiten van Ujeli Care Centre in Nepal. Foto's vindt u terug op onze facebookpagina of onder "media". Alexander De Moor, Vicky Cnops, Lu Wang, Pauline Somers, Jonathan Servayge, Astrid Van Reempts, Ka Chien Choi, Sophie Missault, Arnaud Potvin, Nanou Winter, Timothy Gros, Willem Delrue en Camille Blanchaert. Zoek je nog een cadeau voor Moederdag of wil je je wederhelft verrassen met een kleine attentie? Of wil je jezelf eens verwennen met een lekker kopje thee? In samenwerking met Simon Lévelt Gent bieden wij een mooi cadeauset aan met drie zakjes thee van elk 100 gram en een thee-ei. Dit alles in een mooi afgewerkte verpakking. Last week we had a blast at our band night. Three young bands came to a small cafe in Ghent to play for Ujeli Care Centre. More than 100 persons came to attend the event and we sold as much as 400 beers in just 4 hours. A technical problem at the beginning of the evening couldn't stop the talented musicians from performing. The profit went entirely to our charity. A heartfelt thank you to all musicians and guests!